Heather Mulder Peterson previews her new line Rebel Roses and her inspiration for it! 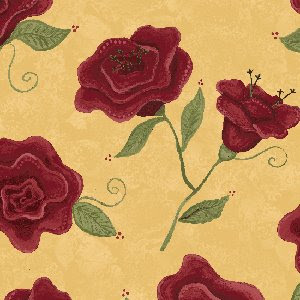 This line was inspired by my (our) love of roses, painted in an impressionist-type style. They represent the traditional side of this line. We also introduced some trendy prints - with the funky flowers, stripes and plaids. I think it turned out as the perfect combination of my two favorite styles. There is a nice mix of scales, with the large roses being the large-scale stand-out print, but also includes some smaller scaled prints that are perfect for piecing quilts. The colors are very fresh and combine some of my favorite colors to decorate with. I think the quilters will really enjoy this aspect of the line because many of the fun, large-scale lines out right now are pretty wild and can be a challenge to decorate with. With this line, you get the best of both worlds! I hope you enjoy using them as much as we enjoyed making them. Hi there, As everyone is now getting well into the Holiday Groove, I’m about to embark on packing up our home – we’re moving on December 21st (yes I know it’s crazy.) But I wanted my kids to be in our new home for Christmas – we’ve been renovating our place for two years!!! Fortunately I’m a bit of a maniac when it comes to unpacking and I’m already spilling over with ideas on how to bring the magic of Christmas to our new home – especially what to do with the fabric from my “Tis the Season” collection and from my new, soon to be released collection, “Winter Wonderland”. 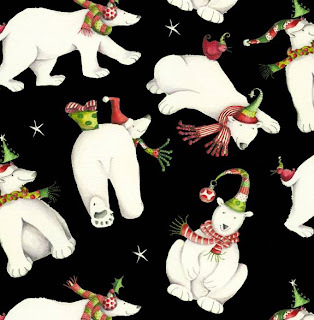 I’m so excited about this new collection - there’s dancing penguins, frolicking polar bears, city skaters and Santa and his elves delivering gifts in assorted trucks and cars, as well as some fabulous bold co-ordinating stripes and dots. I know there’s going to be limits on my time, but I’d be so thrilled if I managed to have Santa and his helpers delivering presents draped on the windows as makeshift curtains as Jules first opens his eyes on Christmas morning and cover Eli’s bed with the city skaters, as he dreams of skating in Central Park this coming winter. Who knows, I may only manage to wrap the gifts and decorate the tree, and that will be okay too, because I’m so fortunate that my home is filled with so much love, excitement, joy and Christmas spirit, and that’s all that really matters. And you know what - there’s always next year………. Have a joy filled, love filled and peace filled Holiday everyone! 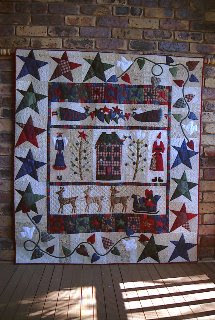 Stay tuned to our HG website to see Debbie's full line of Winter Wonderland...coming soon! It’s very exciting to be here as a guest today on the Henry Glass blog, thanks for inviting me. Today I wanted to tell you a bit about my personal journey and how it has led me to where I am today, it’s a long story so maybe you should make yourself a cuppa tea, grab a cookie, sit back and enjoy the journey with me. 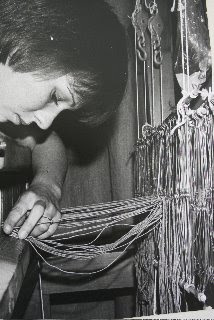 During the few years that I worked in the store I learnt alot not only about spinning and weaving but also about customer relations and how to run a successful business, things that have stood me in good stead throughout the years. By the end of the 70's I was enjoying a variety of crafts, including bobbin lacemaking, spinning and weaving, Fair Isle knitting and of course macrame! The birth of my first son in 1981 heralded the end of my fancy knitting and lacemaking as baby David could undo hours of work in a moment! 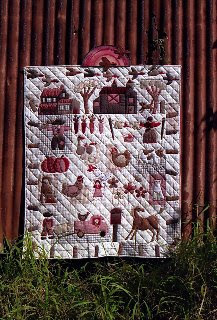 I needed a craft that was portable, produced something to treasure and use, patchwork was the answer. I took an evening class and produced a traditional sampler quilt and this lovely spiders web quilt which apart from the white with tiny roses background was made entirely from my dressmaking friends scrap box. 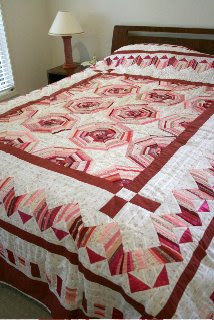 Whenever I show this quilt it makes everyone smile as most people know I dont work with pink fabric but back then I was just grateful for the fabric! Baby Michael arrived in 1983 and we moved to the Channel Islands, from the mainland in 1984. 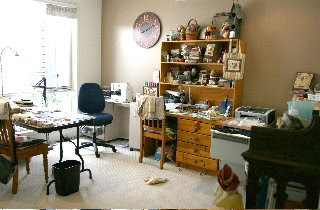 I held classes for patchwork and quilting from our home weekly for almost 40 ladies. 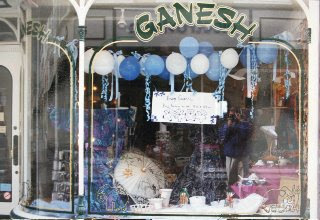 Never one to sit still for too long, Mum and I opened what was to be a very busy gift and clothing store in the bustling high street of St Peter Port, Guernsey. 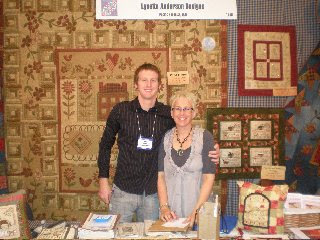 Heres the shop window the day after the birth of my third son, Edward (Eddie) who many ladies got to meet at the recent quilt market in Houston. In 1990 we moved to Australia, my father had lived here in his early teens and had always wanted to return. 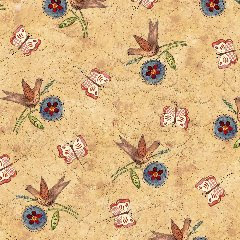 In 1995 I produced my very first patterns, they were marketed under the label Lynette Anderson for The Patchwork Angel, the name angel was chosen as my Dad always called my brother and I his angels (which we were not). The patterns were an immediate success, some of the early patterns are as popular today as they were back then. Heres couple of my all time favourites, On The Farm and Waiting For Santa. 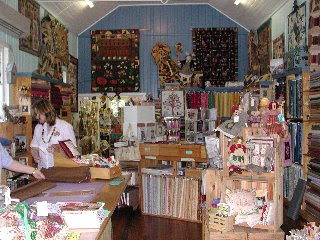 In 1997 with the help of my Mum, Ruth we opened a quilt store, The Patchwork Angel in an old church, on Queenslands Sunshine Coast. 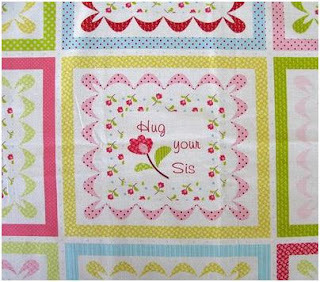 Many people would be forgiven for thinking that the trading name was chosen because of the old church that now housed the quilt store but in fact that name had been chosen two years prior when I released my first patterns. After almost ten wonderful, busy years both in my design business and in the retail business I decided it was time to focus full time on my designing and The Patchwork Angel was sold to one of my long time employees. These days I work from my home studio (aka spare bedroom), I love working from home although I have to admit the first 6 months after I sold the shop was a disaster as I was very undisciplined with my time, these days I am more focussed and am enjoying setting myself some new goals and achieving some new dreams, one of which was to design fabrics. 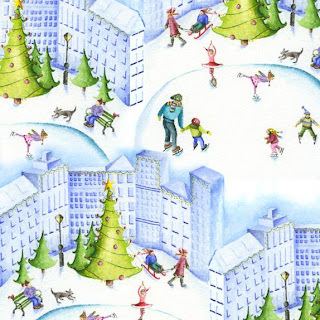 This year I have had the extra excitement of working with Henry Glass & Co producing two fabric lines. 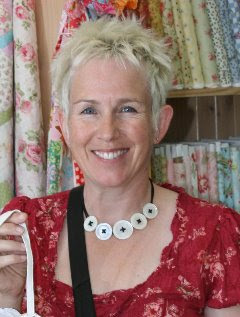 Anne Sutton from Bunny Hill who designs fabric for henry Glass was responsible for introducing me to the wonderful Larry, thanks Anne. It has been a wonderful experience, from posting off my little paintings to seeing how their design team interpreted them to seeing the fabrics on paper and now I am trying to be patient waiting to see the fabric! Where does my inspiration come from? Everywhere, there is something inspiring at every turn of my head, alot of my ideas are stored memories from my childhood. I grew up in the English countryside, my summers were filled with playing hide and seek with my brother in the hedgerows around our home, bringing Mum bouquets of wild flowers and learning the names of the wildflowers, insects and animals that shared lives. Here's an early peek at a couple of the prints from my Hedgerow line of fabric. 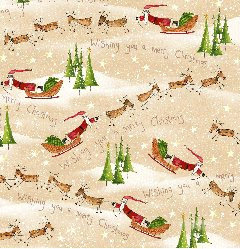 This sneek peek is from my line called Christmas Magic which is for Christmas 2009, I am so excited about working with my very own fabrics, my sketch pad is full of ideas for quilts, aprons, stockings and more! Be sure to check your local quilt shops for Henry Glass fabrics and maybe your local store will have my fabrics on their shelves next year. 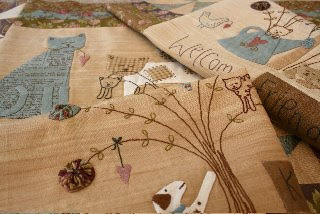 My latest block of the month quilt, 'A Kittens Tale' is inspired by two of our very lovable if a little mischievous house mates, Hugo and Felix who are an inseparable duo who's daily antics keep us and my regular blog readers in stitches! I have recently launched two new, very cute buttons to my handpainted button range. 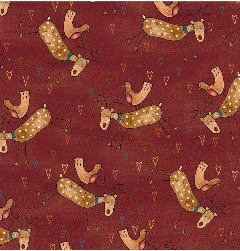 Can you see a Hugo and Felix fabric line emerging soon? I think I can! Talk soon, bye for now! Barbara Jones Update- Bubblegum Basics Are In! 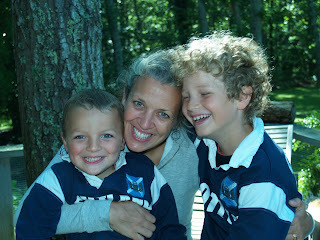 Barbara Jones writes for HG BLOG... "The strike offs of Bubblegum Basics have all arrived! Most of you know that strike-offs are little test samples for each fabric in a collection that the textile mill prepares. The textile mill sends strike-offs to the design director (in my case it is Karen see her in our market photos) at the fabric company (Henry Glass & Co). 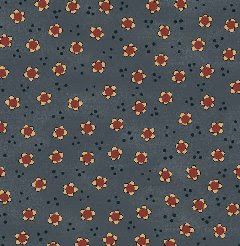 This person looks the fabric over carefully to be certain there are no problems with the printing and they send a set of strike-offs back to the designer (me) for review. It is always an exciting time because this is the first time I see the designs on actual fabric! There can be some surprises and sometimes there are minor changes that need to be made before the mill makes oodles of yards of a particular design".